Although you won't find these street names on maps, Melinda's Alley, Wall Street, and Cactus Way were recognizable addresses during the early years of Phoenix. And yes, there were houses and businesses on them. The reason for this is the gigantic scale of the layout of the blocks of Phoenix going back to 1870. 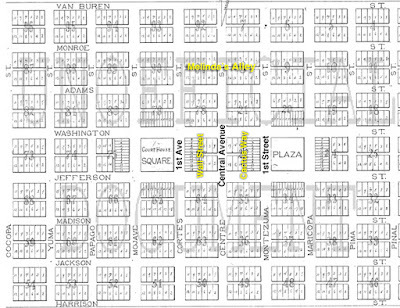 While this huge scale works fine for the skyscrapers of today, when Phoenix was young, these spaces were divided up for a more "human scale". 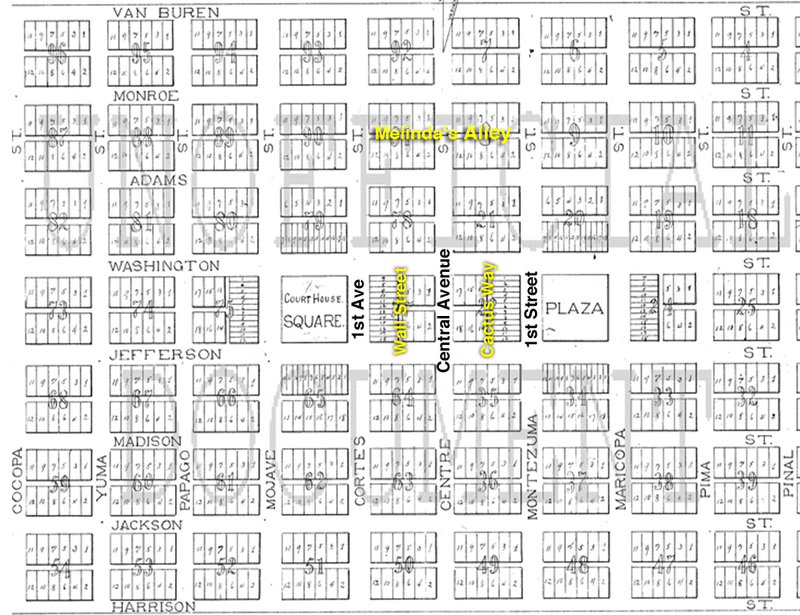 As you can see on the map, Wall Street and Cactus Way were the in-between streets between 1st Avenue and 1st Street. If you're old enough to remember when the Greyhound Bus Terminal was on Jefferson, you could have walked the alley (Cactus Way) north to Washington. Traces of Melinda's Alley are still visible, running east and west through Heritage Square and even as far west as the northern edge of the Adams Hotel (the Renaissance Phoenix Downtown Hotel) and north of the Heard Building. Of course now it's just an alley, but for a long time it was just like any other street. The gigantic scale of the streets and avenues of Phoenix still create a problem right up to modern times. That's why there are Drives, Places, and Lanes. 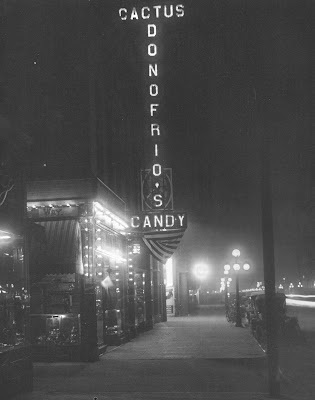 Donofrio's Cactus Candy on Washington between Central and 1st Street. Look closely and you can see the "Way" of Cactus Way in the photo. You're looking west on Washington. Thanks, Michael! Yeah, I see this kind of stuff all of the time! It's traffic lights and stop signs that I seem to miss - maybe you'd better drive!